A richly detailed and easy-to-use reference to 500 years of architectural details and styles. Owners and potential buyers of period houses, restorers, architects, interior designers and historical preservationists will find this reference invaluable. The Elements of Style is the most comprehensive visual survey, period-by-period, feature-by-feature, of the styles that have had the greatest impact on interiors of American and British domestic architecture. Compiled by a team of experts, this is the first book on architectural styles that is comprehensive, incredibly thorough, and accessible in its presentation of individual details. This magnificent volume covers more than 500 years of architectural styles from Tudor to Post-Modern and includes American and British vernacular styles. First published in 1991 (with 150,000 copies sold), this new edition is expanded to include the most contemporary styles. Detailed illustrations include 3,000 analytical drawings and historic engravings, 400 photographs in color and 1,000 in black and white. 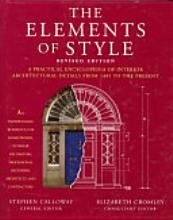 The heart of The Elements of Style is a chronological survey of the primary styles and periods of architectural design. Each chapter begins with an illustrated essay, then covers in detail features such as: - Doors - Windows - Walls, floors and ceilings - Staircases - Ironwork and hardware - Woodwork and built-in furniture - Kitchen stoves and fireplaces - Essential period architectural details, and more. The book also includes: - A useful system of quick reference, employing color-coded tabs showing how particular features evolved over time, and - A fully updated resource list with contact information for locating suppliers of those design elements illustrated throughout the book. The Elements of Style is the essential reference for preservationists, architects, interior designers, owners of period homes, and historians.